Since its establishment, six years ago, our cultural society “I Marchesi del Monferrato” works in historical, cultural and tourist activities in the area of the Monferrato, mainly in the provinces of Alessandria and Asti,. With the cooperation of different institutions, both public ones and privates ones, it has produced a lot of initiatives increasing audience and approval. Here below, you can find a list of what we are able to do and what we are focused on. We are concentrating on the history of last 7 centuries, just right the period that fits with the domain of all the Marquis of Monferrato, but we are working to widen both the geographical area of reference and the historical period. We are trying to carry out new projects to enhance and promote our region, developing marketing strategies and encouraging the rediscovery of our past through different and modern communication tools. 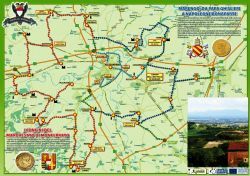 – Creation of a historical and cultural route with a focus on local wines and culinary, even providing maps. – Creation of a travelling team dedicated to increase the awareness and the promotion of the area trough exhibitions, multimedia DVD, illustrated guide and manuals for basic and specialized users. – Computerization, digitization and storage of the existing and specially produced materials, including studios, photographic archives, cultural, tourist and food and wine information. – Creation of an interactive portal dedicated to the project with emphasis on thematic such as local history, culture, culinary traditions and events of different nature. – Promotion through the organization of preparatory workshops, training modules for professionals, educational activities, conferences, studies, with the involvement of the institutions and local authorities in charge of retraining and relocating young people and adults looking for employment. – Specialized periodical and specialist manuals. – Promotion Event: Rediscover the taste of history. – Tourism development and promotion of cultural heritage related to an area bounded on the context or historical identity strongly marked (thematic itineraries). – Relationships with European and Euro-Mediterranean partners. – Castles, abbeys and places: typical handcrafts related to restoration and maintenance with traditional and low-cost techniques (retraining of the artisan labour). – Setting and historical reconstruction: design and production of clothing, weapons, armors, uniforms, saddlery and harness for horses, flags, replicas of coins (including backdrops, scenery, etc. ..) historically correct and documents relating to the historical context. – Regional food and wine products related to an area bounded on the context where the historical identity is strongly characterized.